George A. Romero’s original version of The Crazies (1973) was alternately exciting and dull, a film about madness in small-town America and the violence that erupts both because of it and in efforts to end it. Sadly, the film has never been one to gain much notoriety; Romero’s Dead films grabbed the ample spotlight provided the director, but the earlier version bore all the earmarks of his style: low-budget production, scarcely a recognizable actor, a plodding sense of terror, and a social message just under the surface that would likely be ignored. Romero’s film was solid, but frankly didn’t amount to much. Which is one reason why a remake of The Crazies in 2010 seems like the idea of someone as unbalanced as the slack-jawed, blood-spattered citizens of Ogden Marsh, an Iowa town we first see in magnificent flames before rolling back two days to a pleasant, perfectly normal Spring day. Normal, that is, until a local farmer slogs his way onto the high school baseball field, shotgun in hand. So why a remake? The creative bankruptcy of Hollywood is too easy an answer. What would be gratifying would be to realize that a filmmaker wanted to pay homage to the aging Romero during these latter days, when his talents seem poignantly one-note and weaker with each subsequent film (though it’s only fair to point out that 2007’s Diary of the Dead was far superior to the preceding Land of the Dead, and if advance word is accurate, the upcoming Survival of the Dead). But no, in this age of glossy, clever remakes with varying results, The Crazies seems to have been made strictly out of a need for box office gold. And even if the new film won’t be remembered as a classic thriller, it is a solid film, and deserving of praise (and yes, a healthy box office return). After gunning down the farmer (who as a former alcoholic was assumed to have fallen off the wagon and ended up on the threat end of the drunk scale), Sheriff David Dutton (Timothy Olyphant) expects the coroner’s report to back him up, but the next morning he’s told the man had a blood-alcohol level of 0.0. And in that short time, two more townspeople have begun to stare off into the distance and turn ugly. These are not zombies in the traditional sense, either by Romero Slow Dead or New-Coke Speedy Infected measurements. They “play statue” and then wander off to grab some form of sharp implement, gun or flammable liquid with which to dispatch family members, or anyone who happens to be in their path. Dutton, his dutiful wife-doctor Judy (Radha Mitchell) and ambiguously straight-faced deputy (Joe Anderson) are soon swept up in a frantic search for answers, survival and ultimately escape from a zone of alternating dangers: killers they once called friends, and military forces that show up to contain the populace. The most rewarding elements of the film are the ones so many similar efforts get wrong: pacing, thrills per minute, an effective cast. While it may seem perfectly predictable, the cycle of each scene (examination, lull, threat, attack, relief) works well, and the film builds a very palpable tension over and over again, even when we know exactly what could be lurking in the shadows (and usually is). But the cast of The Crazies is really spot-on. 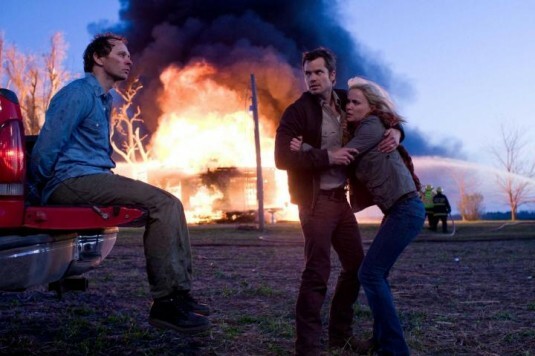 Olyphant is fast becoming the likable, rugged male lead that we’ve been missing for some time. Mitchell seems to have created a niche for herself as the Serious Dramatic Female in genre films (Pitch Black, Silent Hill, Rogue, Surrogates) as it seemed she was poised to do in art house fare (High Art). And Anderson, memorable as Evan Rachel Wood’s more adventurous older brother in Across the Universe, gets to play the one character that doesn’t seem cut from very specific cloth. Deputy Russell Clank starts off as supportive stalwart to the Sheriff, yet as events become more threatening, his actions and reactions are less predictable, and the reasons for them even more so. The Crazies may not be original, daring or even that memorable. But solid entertainment doesn’t always have to be, if well-constructed, acted and able to deliver the thrills and scares at a decent clip. The past two months, usually a graveyard of cinematic mistakes and embarrassments, has been a surprisingly sturdy period of genre plots that sometimes worked (The Book of Eli, Daybreakers), failed (Legion, The Wolfman), and one that may be remembered by year’s end (Scorsese’s other crazies). But all were bolstered by more-than-sufficient style, enjoyable casts and themes that give their pulp surroundings some much-needed dramatic heft. Next week, Alice in Wonderland will arrive in 2-D, 3-D and IMAX, and will likely become a national phenomenon. But that kind of hipster-tinged fantasy can hardly hold a candle to the murky depths of solid genre work. The Crazies suitably fills a need for giddy, polished productions that are about nothing if not the threat of dank, ugly terror launched from the shadows.